Vidharth tied the nuptial knot with Gayathri in Tirupati today. 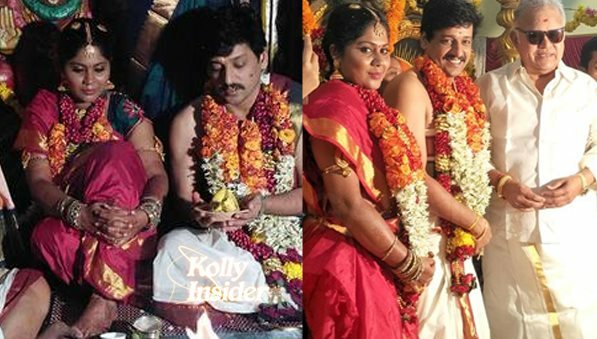 Vidharth of Mynaa fame announced the wedding some months ago after he was recently engaged to Gayathri Devi, daughter of Sivanandam, a lawyer in Palani. Today, at the presence of Lord Venkateshwara in Tirupathi, Vidharth tied the knot. The reception for the newlyweds will be held on June 17th in Chennai which will be attended by the top stars in the industry. Viddharth is one of the fastest rising young heroes in Kollywood with his debut venture Myna doing very well at the box office. He had co-starred with Ajith in Veeram, which is yet another major breakthrough for him and acted in other notable films like Jannal Oram, Venmegam, Pattaya Kelappanum Pandiya, Aal and latest release Kaadu. Kollyinsider wishes the young couple a very happy married life!